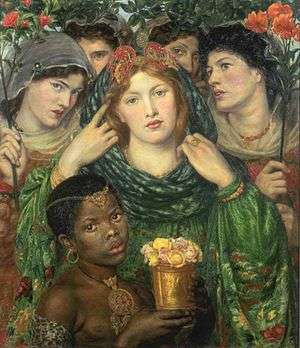 The Beloved (also The Bride) is an oil painting on canvas by English artist Dante Gabriel Rossetti, first painted in 1865 and currently housed at Tate Britain. The bride, caught in the action of moving back her veil, is attended by four virginal bridesmaids and an African page. All contrast strikingly with the red hair and pale skin of the bride: not just the African skin and features, but also the varying shades of brunette hair and dark caucasian skin tones of all four bridesmaids. It has been suggested that this colour contrast, carefully painted as a frame to the bride's features, was influenced by a controversial painting by Édouard Manet, entitled Olympia (first exhibited in 1865). Rossetti made a visit to Manet while working on The Beloved, and the painting also owes much to the works of Titian. Rossetti arranged the bride in a head-dress which is distinctly recognisable as Peruvian, and in a Japanese gown. Again, this abundance of exotic fabric frames the face of the bride, dominant in the centre of the canvas, with its western-European features. Rossetti ostensibly finished this oil in 1866, but continued to make changes to it throughout his life. ↑ J. Treuherz, E. Prettejohn, and E. Becker. Dante Gabriel Rossetti. London: Thames & Hudson (2003). ↑ V. Surtees. Dante Gabriel Rossetti. Vol.I, Oxford: Clarendon Press (1971). Fredeman, William E. (Ed.) (2002-8) The correspondence of Dante Gabriel Rossetti. 7 Vols. Brewer, Cambridge. Linafelt, Tod (2002). "Biblical Love Poetry (...and God)". Journal of the American Academy of Religion 70 (2). Pope, Marvin H. (1977). Song of Songs: A New Translation with Introduction and Commentary.Anchor Bible 7C. 2 volumes. Garden City, New York: Doubleday. Todd, Pamela (2001). Pre-Raphaelites at Home, New York: Watson-Giptill Publications. Wikimedia Commons has media related to Dante Gabriel Rossetti.